Do you want to upgrade and be ready when the fruit picking season arrives? Then this is the moment to think about upgrading your current packaging lines for apples and pears. JASA can help you with weighing and packing apples and pears in bags, and also on trays. “Apples are a product made by nature and they come in all shapes and sizes,” Piet Pannekeet, founder of JASA explains. “Only the roundest, equal apples in both shape and size are packed onto trays for the consumers.” Which size ends up on the tray, depends on the number of apples on the tray. In Belgium and the United Kingdom, the trays contain six apples are the smaller sizes of apples between 60-70mm. 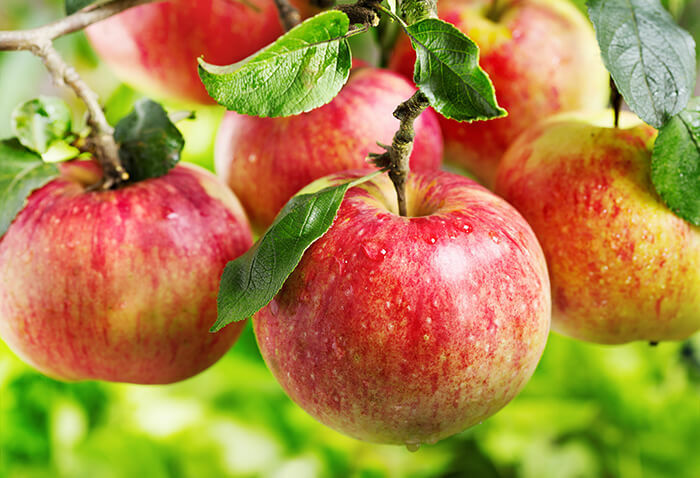 While in the Netherlands and Germany the trays with six apples contain apples measuring 75-80mm. The smaller apples are being sold separately or in special packages. Lastly, the larger apples are either sold separately or in trays containing four apples. After the apples are placed onto the tray, they will be corrected, so the blushes face upwards. “Usually, this is done by hand,” Piet says. “There are some companies that use a robot with vision for this. 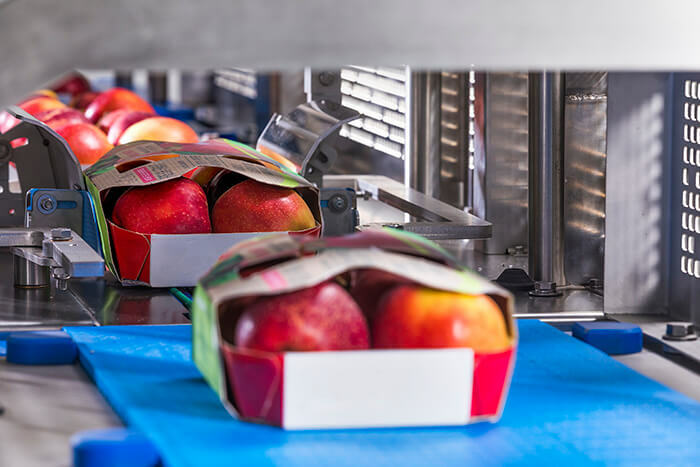 However, this is a very new development and still very expensive.” After that, the apples will be packed with a foil material to secure the apples onto the tray and protect them during transportation. 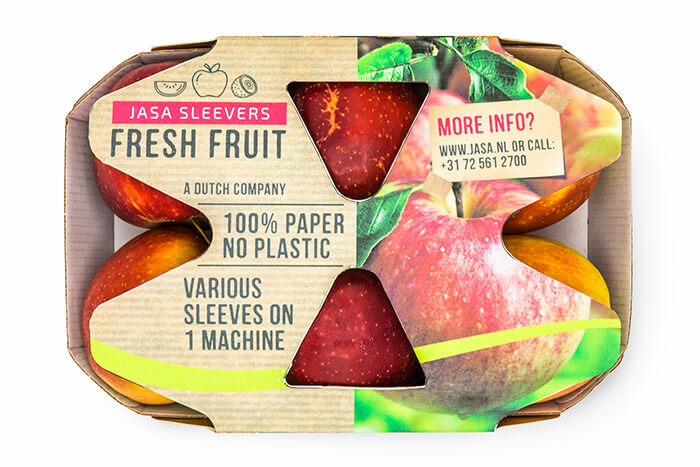 Recently JASA launched a new sustainable solution for apples that is suitable for recycling. With the cardboard sleeve for apples, they stay visible in the packaging while being secured in place at the same time. The sleeve also offers more space for marketing and product information. Lastly, the sleeve contains a handle to make the packaging easy to carry. However, the most important thing is that this cuts out the need for foil material making the apple trays suitable for recycling. The JASA Sleever is a compact machine that can easily fit into existing lines. Depending on your wishes, the Sleever can process 40-80 packages per minute. The Sleever for apples launched at Fruit Logistica 2019 in Berlin. We received great responses, especially from the American market. Do you want to start packing apples in a sustainable manner? Get in touch with us. We’re more than happy to find the right solution for you and your products. The first one to know about our latest innovations? Sign up for our newsletter! JASA Packaging Solutions stands for innovation, quality and flexible packaging machines. We are your specialist partner in the development of vertical packaging machines, Sleevers, and complete weighing and packaging lines.